With a stay at this villa in Mesogi, you'll be within a 15-minute drive of Tombs of the Kings and Saint Neophytos Monastery. A roundtrip airport shuttle is provided for a surcharge (available on request), and free self parking is available onsite. 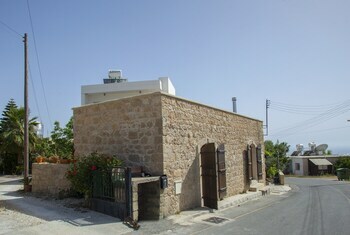 With a stay at this vacation home in Protaras, you'll be within a 15-minute drive of Ayia Napa Monastery and Profitis Elias Church. Free self parking is available onsite. With a stay at Sunrise Arches Apartments in Limassol (Germasogeia), you'll be within a 15-minute drive of Limassol Castle and Dasoudi Beach. Free self parking is available onsite. When you stay at StayCentral in Larnaca, you'll be by the sea, a 4-minute drive from Finikoudes Beach and 7 minutes from Europe Square. Free self parking is available onsite.